The latest album by local music teacher and multi-instrumentalist Kathy Sherman isn’t just for kids – it features some of them as background singers as well. “I have kids singing on it that I have been teaching for many years, and my hopes are that when a child listens to this album and hears the kids, they will be able to imagine themselves on there someday,” the Los Altos resident said. 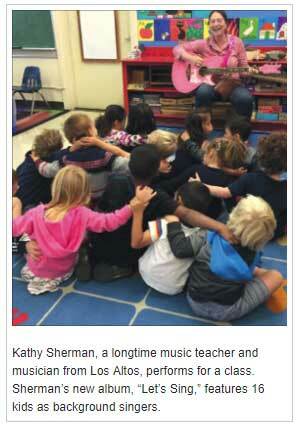 Sherman has taught music for nine years, leading 17 preschool classes for a total of approximately 300 kids. They roughly range in age from 2 to 5. The sing-along album combines folk songs with rhythmic movement to teach kids songs while developing neural pathways for movement in response to music. Sherman explained that the movements include clapping, walking, dancing and singing, and that kids deprived of the opportunity to develop such skills at a young age may never be able to learn them. The song choice heavily emphasizes building community through music, added Sherman, who hopes that teaching kid the same songs will give them something to refer back to and sing together. A songbook is included with the CD, encouraging children to learn a new instrument by playing along to songs they love from the record. Sherman said she takes an individualized approach to each class. Classes for toddlers work on rhythmic movement, while pre-kindergarten classes work on songs they can take with them to other activities, building community. Sherman plays more than eight instruments. She tries to vary the instruments she brings to class, in size, type and color, to build anticipation. She said when kids do not know what she will bring, they look forward to her visits more, and are often excited by seeing something they have never seen before, like a pink guitar.